MILLINGTON, Tenn. -- While afternoon rains put a damper on the Summit Racing Equipment sportsman championships, action in the Nitro Jam ranks was as hot as ever as Tennessee's own Clay Millican and Ron Hope swept the action in IHRA's professional categories at the Summit Racing Equipment World Finals at Memphis International Raceway. 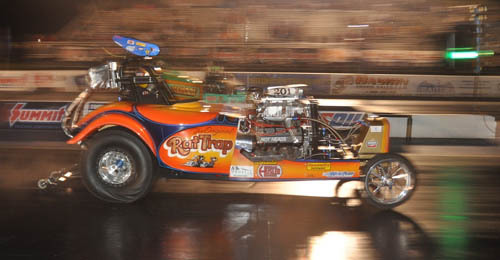 Millican won for the second night in a row in the world's most exciting racing class of Top Fuel, joining Ron Hope in Fuel Altered as the only two drivers to take home two Ironman trophies. Joining the duo in the winner's circle was Peter Gallen in AMSOIL Prostalgia Nitro Funny Car and Jake Stordeur in Nitro Harley. Millican, from right down the road in Drummonds, Tenn., bested longtime friend and rival Bruce Litton four out of four passes during the weekend. 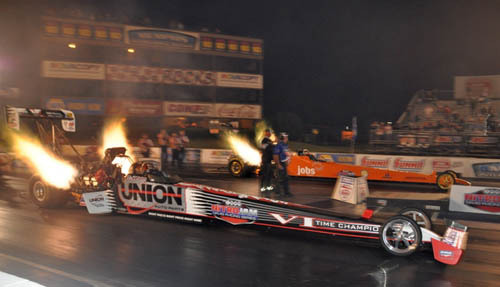 Both drivers struggled to find traction Saturday night as the tricky conditions got the best of them, but it was Millican getting enough of a push to come away with round wins culminating with a final pass of 5.361 seconds at 183.32 miles per hour in the winning effort. Equally as exciting were the extreme runs of Nostalgia Fuel Altered as Ron Hope and Kyle Hough took up every inch of their own lanes and, occasionally, the other lane as well. Hope drove "Rat Trap" to both round wins on Saturday as Hough both times found himself crossing the finish line in the opposing lane. Hope's final, race clinching lap was a 6.363, 215.27 with Hough following right behind in the same lane. Peter Gallen defeated Mike Halstead in the final. 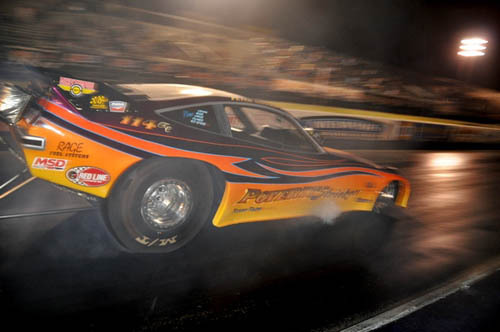 In AMSOIL Prostalgia Nitro Funny Car Peter Gallen made up for all kinds of issues on Saturday to pick up his first IHRA Nitro Jam win in several months behind the wheel of the "Poverty Stricken" Monza. After dispatching of Mike Minick in round one with an incredible 5.842, 248.48 pass, Gallen went back to work in defeating Mike Halstead and the "Candies & Hughes" team with a 6.012, 241.11 winning pass. Halstead had a 7.121, 159.74 in the runner-up effort. Finally Jake Stordeur closed out the evening with a win over Chris Smith in Nitro Harley as both bikes peddled off of the line, with Stordeur getting the ship righted just enough to cross the line with a 7.084, 201.70.